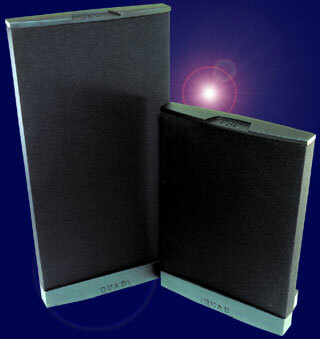 The electrostatic loudspeaker deals with charged electrons attracting and repelling each other. Equal charges repel each other and opposite charges attract each other. This principle is the foundation of the electrostatic concept. An electrostatic transducer consists of three pieces: the stators, the diaphragm and the spacers. The diaphragm is what actually moves to excite the air and create music. The stator's job is to remain stationary (hence the name stator) to provide a reference point for the moving diaphragm. The spacers provide the diaphragm with a fixed distance in which to move between the stators. The history of Quad is one of audio excellence. The early products were all firsts of their particular type and cast the mould for the products which would follow for many years afterwards. The company was founded in 1936 by audio master Peter Walker, under the tiltle, the ‘Acoustical manufacturing company’. The company produced ‘Public Address’ systems and compact amplifiers (relatively speaking). In 1949, The company produced the ‘Corner Ribbon Loudspeaker, producing higher frequencies than had ever previously been achieved. In the same year, the QA12/P was launched and the brand ‘QUAD’ was born from an acronym ‘Quality Unit Amplified Domestic’. Shortly after the Quad12/P, the now legendary Quad II was launched, a control unit with two monoblock valve amplifiers. It was around this time, that a series of concerts were given at both the Royal Festival Hall in London and 'Carnegie Hall’ in New York. Gilbert Briggs, founder of Wharfedale was trying to prove that recorded music could compete with live music. A capacity audience of 3000, filling the Royal Festival Hall, listened to Peter and Gilbert demonstrate the undeniable clarity and quality of well designed, and well-built hi-fi. In the period from 1957 to 1966, innovation was fast. Improved broadcasting meant a high demand for quality reproduction equipment. During this time, Quad developed the world’s first ever full range electrostatic loudspeaker, nicknamed ‘Walkers little wonder’ and later called the ESL-57. In 1955 Quad introduced the first electrostatic loudspeaker for home use, the Quad ESL . Later this ESL is called ESL 57 (also ESL 55) to distinguish it from its younger brother, the ESL 63. In 1985 production of the ESL 57 stopped, there were about 60.000 produced. There are still thousands around, playing very well and giving their owners a lot of audio pleasure. In 1981 Quad introduced a new ESL, the Quad ESL-63. Later Gradient introduced a subwoofer system, the SW-63. In 2000 Quad introduced a new ESL-system, the 98 series. This serie has evolved from the ESL-63 into a family of models of which the 988 and 989 are the first. The ESL-988s are a direct replacement for the legendary ESL-63. And all the original features have been retained. The rigidity has been improved and 95% of the components have been upgraded. to an enhanced performance in the mid-band.